Kit of follica in the next months the sale? Como acabar com a calvice de uma vez por todas com um novo tratamento contra calvície e calvíce. The human beings are born with a fixed number of hair folículos, but they can be lost when the genetic calvície if establishes, or through damages to the skin and in illnesses as alopecia. The market to treat these problems is of U$ 10 billion to the year and exists used robots even though being in the hair transplant. But, however, not yet a truily efficient solution exists. But George Cotsarelis of the University of the Pennsylvania and colleagues say that they can stimulate the formation of new hair folículos reverting the process of the calvície. First an abrasive wheel is used that is rubbed in the cabeludo leather, stimulating the formation of a new layer of young cells in the surface, in substitution. The name of the process is neogênese to folicular and consists of generating new hair folículos after the birth. When treating these new cells with certain drugs that inhibit epidérmicos receivers of growth of hair in the surface, make with that some of the rising cells form the new hair folículos. The team says that already it successfully tested the idea in rats and skin human being transplantada in rats. They had created a company to commercialize the product in the future, that will consist of a kit of products with instructions of as to apply them in the skin so that the hair comes back to grow. The process of formation of `new pele’ takes two weeks since the start of the administration of the composition. Beyond inhibitor of receivers the kit contains a product that consists of antibodies that stimulate the growth of hair, biological antihistamine, an antibiotic and an antimicrobials. The similar kit also contains the medicine minoxidil and that is “abridores of canals” that favor the growth of hair. The product can be used for hair regeneration or to make to be born for the ones in other places of the face as in the cheek, chin, inferior part of the cabeludo leather and sobrancelhas. The product could be applied one or two times per day during two up to 10 days consecutive to favor the birth of new hair folículos and subsequent growth of new hair. As if this was not enough the kit includes method for the sprouting of hair pigmented when suppressing a Wnt protein in folículo hair.
" Beyond inhibitor of receivers the kit contains a product that consists of antibodies that stimulate the growth of hair, biological antihistamine, an antibiotic and an antimicrobials. The similar kit also contains the medicine minoxidil and that is “abridores of canals” that favor the growth of hair." » favor the growth of hair." and some antibodies … what kind of antibodies? androgen receptor antibody? First is used as an abrasive wheel is rubbed on the scalp, stimulating the formation of a new layer of young cells on the surface in place. O nome do processo é neogênese folicular e consistem em gerar novos folículos capilares depois do nascimento . The name of the process is neogênese follicular and are to generate new hair follicles after birth. Ao tratar estas novas células com certas drogas que inibem receptores epidérmicos de crescimento de cabelos na superfície, faz com que algumas das células nascentes formem os novos folículos capilares. In addressing these new cells with certain drugs that inhibit receptors of epidermal growth of hair on the surface, causes some sources of cells forming the new hair follicles. A equipe diz que já testou a idéia com sucesso em ratos e em pele humana transplantada em ratos. The team says that the idea already tested successfully in rats and in human skin transplanted into mice. Eles criaram uma empresa para comercializar o produto no futuro,que consistirá em um kit de produtos com instruções de como aplicá-los na pele para que o cabelo volte a crescer. They created a company to market the product in the future, which consist of a kit of products with instructions on how to apply them to the skin so the hair to grow back. The process of forming the ‘new skin’ takes two weeks from the beginning of the administration of composition. Além do inibidor de receptores o kit contém um produto que consiste em anticorpos que estimulam o crescimento de cabelo, anti-histamínico biológico, um antibiótico e um antimicrobiano. In addition to inhibiting receptors, the kit contains a product which consists of antibodies that stimulate the growth of hair, anti-histamine biological, an antibiotic and an antibiotic. O kit também contém o medicamento minoxidil e similares que são “abridores de canais” que favorecem o crescimento de cabelos. The kit also contains the drug minoxidil and the like that are “abridores of channels” that favour the growth of hair. O produto pode ser utilizado para regeneração capilar ou para fazer nascerem pêlos em outros locais do rosto como na bochecha, queixo, parte inferior do couro cabeludo e sobrancelhas. The product can be used to regenerate hair or to make hair born in other places as the face on the cheeks, chin, the bottom of the scalp and eyebrows. O produto poderá ser aplicado uma ou duas vezes por dia durante dois até 10 dias consecutivos para favorecer o nascimento de novos folículos capilares e subseqüente crescimento de novos cabelos. The product can be applied once or twice a day for two to 10 consecutive days to encourage the birth of new hair follicles and subsequent growth of new hair. Como se isso não bastasse o kit inclui método para o surgimento de cabelos pigmentados ao suprimir uma proteína Wnt no folículo capilar. As if that were not enough kit includes the method for the emergence of pigmented hair to remove a Wnt protein in the hair follicle. Apesar da empresa já ter entrado com a patente do produto ele ainda está em fase de desenvolvimento e levará alguns meses para chegar a mercado . Although the company has entered with the patent for the product he is still under development and will take several months to reach market. Para receber atualizações sobre este produtos e nossos demais artigos assine nosso newsletter no campo abaixo. To receive updates on this product and our other articles sign our newsletter below. I think it is quite clear that this “article” is purely based on the patent and that they have no other source. They pretty much repeat everything that is mentioned in the patent (and known by us). So I think the “available in a couple of months” should be considered pure speculation with no official or unofficial follica sources. Well if this is true, if it is to be realeased soon as a kit for everyone to buy (and probably cheap), then it probably isn’t the “cure” we awaited. Maybe slightly better than Rogaine and Propecia, but I doubt it could bring you a fulld head of hair. Where does it say it will be for sale in the next few months? » Where does it say it will be for sale in the next few months? It says several months I think. If it is true, it is really incredible. Strange that it hasn’t been published in an american newspaper, why spanish (or portuguese)? Oh come on ppl. How can you be such naive kiddies? Of course the journalist just read the patent and made up the rest. I mean, I admire the guy for reading the patent. Most make up all of the story. The “months” is just his naive uneducated guess. This is a personal interpretation that is based on the patents. “A doctor would first use a microdermabrasion tool,say,or a laser to remove the top layers of the skin—as is already commonly done in a number of dermatologic and cosmetic procedures—knocking some cells back into a primitive state.The doctor can then use this newly created therapeutic window to INJECT DRUGS that push the cells to develop along one pathway or another and grow hair or skin.Zohar won’t reveal what drugs Follica is using, except to say that they are SMALL MOELCULE DRUGS NORMALLY TAKEN ORALLY FOR PURPOSES WITH NO RELATION TO HAIR GROWTH." “INJECTED DRUGS” – Not a damn topical. “WITH NO RELATION TO HAIR GROWTH” – Minoxidil is related to hair growth. Who is going to know more? Daphne Zohar or some Portuguese reporter? This is what I was talking about in another thread. When it comes to our hair loss we loss the ability to think clearly. » hair loss we loss the ability to think clearly. Some people here clearly lack that ability at all, they are wishful thinkers and even will get mad at you if you don’t accompany them. » This is a personal interpretation that is based on the patents. » TAKEN ORALLY FOR PURPOSES WITH NO RELATION TO HAIR GROWTH." » “INJECTED DRUGS” – Not a damn topical. » “WITH NO RELATION TO HAIR GROWTH” – Minoxidil is related to hair growth. » Who is going to know more? Daphne Zohar or some Portuguese reporter? actually loniten (oral minoxidil) was for blood pressure originally and it had no relation to hair growth. 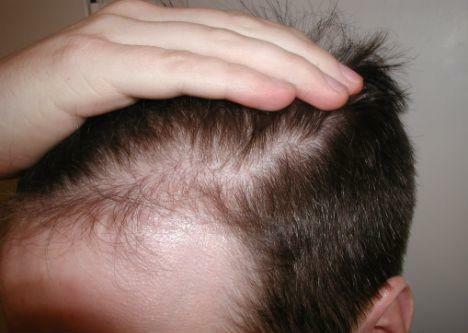 Minoxidil is mentioned very prominently in the follica patent and was used in a experimental example as an adjuvant. I can almost guarantee you that they will use minox along with an egf-antagonist and an anti-androgen-----------which was the simpleist embodiment of the patent. The anti-androgen, finasteride, was a prostate medication before it was a hair medication just like minox, therefore Zohar can claim these things aren’t for hairgrowth–but they are. EGF antagonism is the key element in all likleyhood, or people with bad sunburns would get hair all over their shoulders. Yeah, it certainly COULD mean a literal injection. But IMO that does not sound like a great way to go about this process. Sounds kind of hit-or-miss, and the systemic absorption would probably be an unknown factor to contend with. Topical would be better. And I think topical absorption of Gentifib-type drugs already has some history of working. » had no relation to hair growth. Unwanted hair growth on the face & body was a side effect for 8 out of 10 people that took the orals. » can claim these things aren’t for hairgrowth–but they are. So based on this rational,when she claims that drugs will be injected into the scalp she is infact inferring that it will be a topical? Yeah OK,I guess our “interpretations” of what we read differ.I for one won’t be disappointed when this “kit“ isn’t released in a few months.